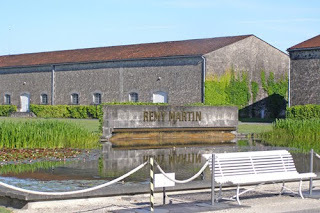 My first venture into the world of spirits travel came just a few months ago as I had the good fortune to be invited on a press trip to Cognac, France. We were quite a group -- journalists specializing in spirits (and/or travel) and representatives from the four major cognac producers. The trip began in the lounge of British Airways at JFK, where we met for the first time to embark on our weeklong journey. I would highly recommend Open Skies, as an affordable all business class alternative to Paris, with comfortable seats and excellent food. It was my first venture into Paris’ Orly airport and I was pleasantly surprised with how quickly we were out of there and on a bus to Montparnasse train station. From Montparnasse in downtown Paris, you can reach Angouleme on the high speed train in about three hours. From there it’s just a scenic 30 minute ride to Cognac, where our first night was at Chateau de L’Yeuse, a quaint and beautiful accommodation where we could have tea on the terrace, overlooking the rolling hills and greenery of Cognac. Cognac is more than a drink, it’s a town full of cobblestone streets on the banks of the Charente River. The shops and cafes line the streets, which provide for a great walking tour if you don’t want to take the tram from the Tourist and Information Office. 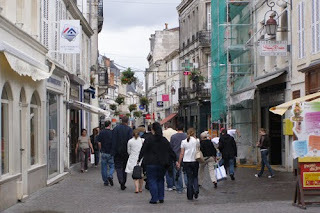 We strolled up Vieux Cognac and past the striking architecture of the Musee des arts du Cognac (Art & History Museum); the Chateau and Saint-Jacques Gate (the town's walls); and the river that leads to the Gabare and Marina. In the middle of the town is the statue of King Francis I, born in Cognac in 1494. There are also two churches, Saint Leger's and Saint Martin’s, which date back to the 11th and 12th century. 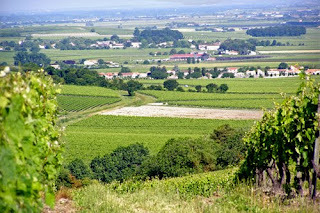 There are four regions in this area that produce Cognac -- Grande Champagne, Petite Champagne, Borderies, Fin Bois, Bon Bois and Bois Ordinaires. The basic process of the beverage is simple: it starts with wine; turns to eau-de-vie; and is blended into cognac. I also learned what those letters on the bottle mean: VS-Very Special; VSOP-Very Superior Old Pale; and Napoleon XO-Extra Old. The reason cognac is so much more expensive than wine is because of the aging. Starting with a liter of wine, after 20 years of aging, you have two thirds of a liter. In an additional 30 years, there’s just half a liter. And, after a hundred years, there is only 10% of the original liquid. It is the blending of these “eau-de-vies” of various ages that makes cognac -- the older the liquid in the blend, the more expensive the drink. Cognac was first produced in the middle ages and today 96% of the world's cognac made in France. The majority of that (80%) comes from four major distilleries -- Hennessy, Martell, Remy Martin and Courvoisier. The day started bright and early with a true French breakfast of croissants, fruit, cheese and yogurt. 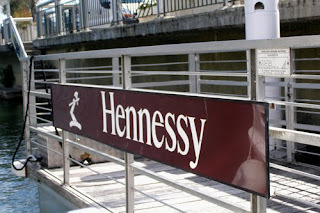 We headed through the windy roads of Cognac to the Hennessy Vineyards. Cyrille Gautier-Auriol, Hennessy's Ambassadeur de la Maison, met us there to show us the vineyards, explaining how the grapes from this region don't make great wine, but they produce outstanding brandy — which can be blended for the best cognac. From the Visitors Center we took a short boat ride to the Distillery and Aging Warehouse across the River. From there we were then whisked off to the Tasting Room, where the Maurice Hennessy himself joined us. We sniffed, smelled and tasted our way from 180° pure alcohol to the eau-de-vies and samplings of XO, Paradis and finally Richard Hennessy, the most expensive in the line. The experience at Martell was a bit different as the company has its own cooperage (to make barrels for aging) so we learned quite a bit about wood. Martell uses fine grain woods to make finer and denser cognacs. To illustrate the point, we were taken to the company's cooperage for a fascinating barrel-making lesson. 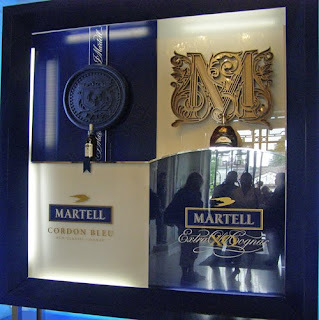 Martell's Distillery had a tasting for us of VSOP, XO and Cordon Bleu. Then it was on to the Founder's House, former home of the company’s founder, John Martell. It is definitely worth a visit as the house, originally built in the 1700s, and is full of historic photos and documents. We spent the evening at Martell's estate, Chateau Chanteloup where were treated to an incredible meal, a special tasting of their prized L'Or Cognac and one of my favorite wines, Jacob's Creek Riesling (also produced by the Pernod-Ricard group). After dinner and cognac, we were treated to a welcome by some of Chateau Chanteloup's residents -- a group of deer that enjoyed the attention as they ate out of our hands! Then it was off to bed to rest up for the next day’s distilleries. We began the day in the visitors' center and were given an introduction to Remy Martin . The company began in 1724 and produces 1.8 million cases per year. They only use the Petite Champagne and Grande Champagne vineyards in Remy products, using 500 different distillers. We walked through the cellars, with the smells from the barrels permeating the room , before heading onto the Remy Martin tram. Then it was on to the blending room, where we got to make our own cognac. After blending came tasting of Remy Martin’s cognacs. Lunch was at Remy Martin’s Chateau Saint Martial estate. The weather was just perfect and it led to an incredible scene as we sipped cognac and enjoyed the countryside before the afternoon’s activities. Taste-Very complex and elegant -- rich -- supple -- tender -- stylish. 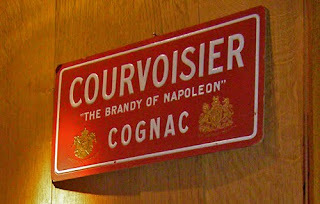 The distillery tour brought us through the making of Courvoisier and tastings of their products. We spent the evening at Chateau Courvoisier, with a tour of the Privi (Paradise) Cellar, with bottles and barrels dating back centuries. Hotel Napoleon Paris before heading back home with a great experience – and a new subject to write about. I was lucky enough to have my cognac education hands on as I toured the region and tasted at the four distilleries. If you can't get there (or are planning a trip and would like to learn more first), the Bureau National Interprofessionnel du Cognac (BNIC) has a Cognac Training Tool Kit. It is available online with levels in different levels for professionals and amateur tasters. They are available in English, French and German, taking you through from an introduction to Cognac and the terms around it, to the best ways to drink it and information on the producers of this beverage.